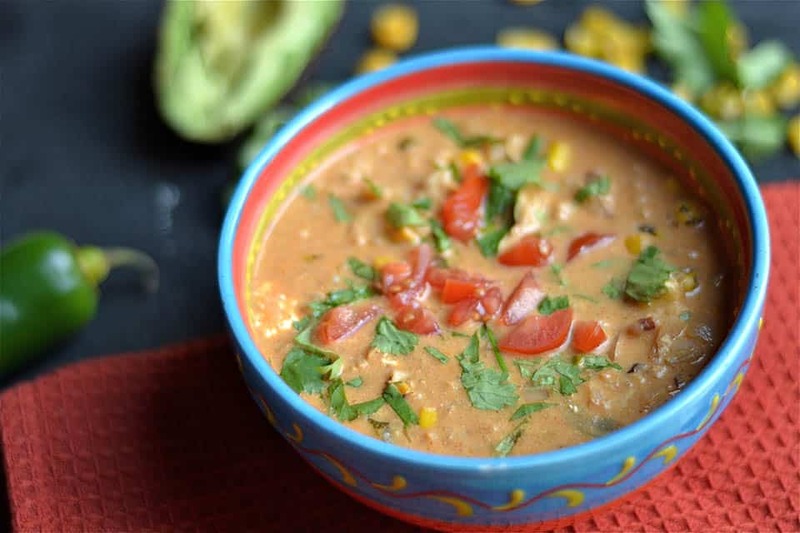 Creamy Chicken Enchilada Soup combines all the flavor of an enchilada dish into a hot bowl of creamy deliciousness! 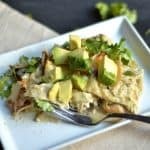 A lower carb way to enjoy enchiladas. Top with your favorite garnishes for a real treat on a cold day! I’ve used the word creamy to describe just about every darn dish I’ve made in the last few weeks. I hope you don’t mind. I sure don’t. Clearly I’m in comfort food mode. Oh, and creamy doesn’t have to mean unhealthy. I feel like I need to put that out there to make myself feel better. 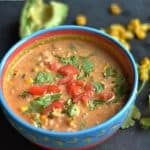 I realize that I’ve made 2 Mexican inspired dishes back-to-back, and even share 2 recipes this week on my weekly meal plan. I hope you don’t mind that either. My family eats what I’m in the mood for, and generally Mexican food is only greeted with positive enthusiasm. Back to the Mexican food thing, I’m headed to Mexico next week for Thanksgiving. I can’t wait!! So I have Mexican food on the mind. And I want it everyday. And in case you were wondering, why yes, I’m sure plenty of more Mexican food recipes will be coming in December inspired by my trip. I can eat soup every darn day of my life. 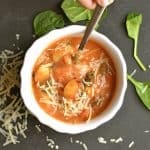 I am always trying to find ways to make my favorite dinners into soup. It’s comforting, it’s lighter, you can throw in tons of vegetables, it fills you up, it doesn’t make you full, the list goes on. Enchiladas are one of my favorite meals EVER!! 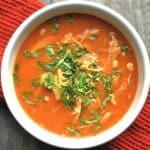 I’ve been making plenty of different versions of enchilada soup for years now. And I’m very excited to share with you this creamy version! What I’ve done here is is throw in a few veggies like onions, peppers, corn with some shredded chicken and rice. I then use 2 different types of enchilada sauce, use your favorite. I personally love to mix tomatillo or salsa verde enchilada sauce with the traditional red. The choice is yours! No, I don’t make my enchilada sauce homemade for this soup. Just trying to keep it simple. My favorite one is from my favorite store: Trader Joe’s. I know Hatch also makes a great enchilada sauce. 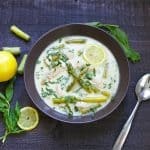 Add some broth to create the soup, and then finally add in a bit of cream cheese and sour cream to make it creamy. 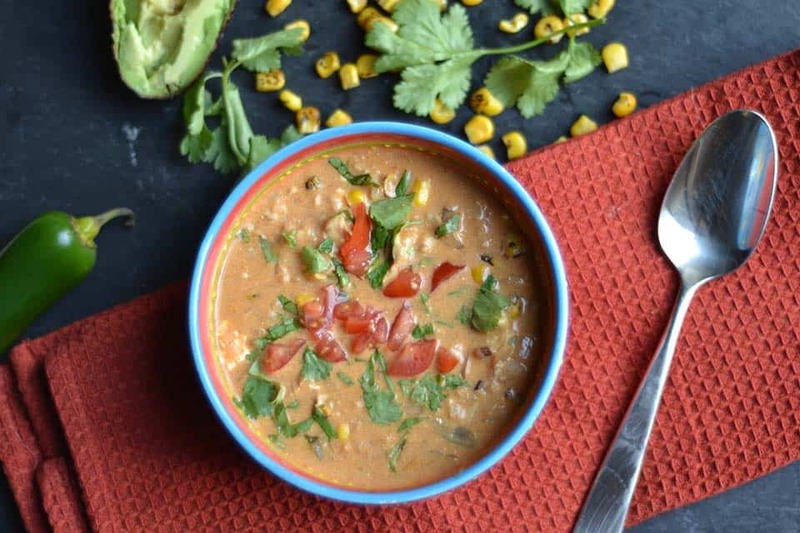 And yes, you can definitely omit those things if you want your soup to be dairy-free!! Top with your favorite things. My usual suspects are tomatoes, cilantro, green onion, and avocado. Cheddar cheese and chips are a favorite for my kids (duh, all kids like the junk). 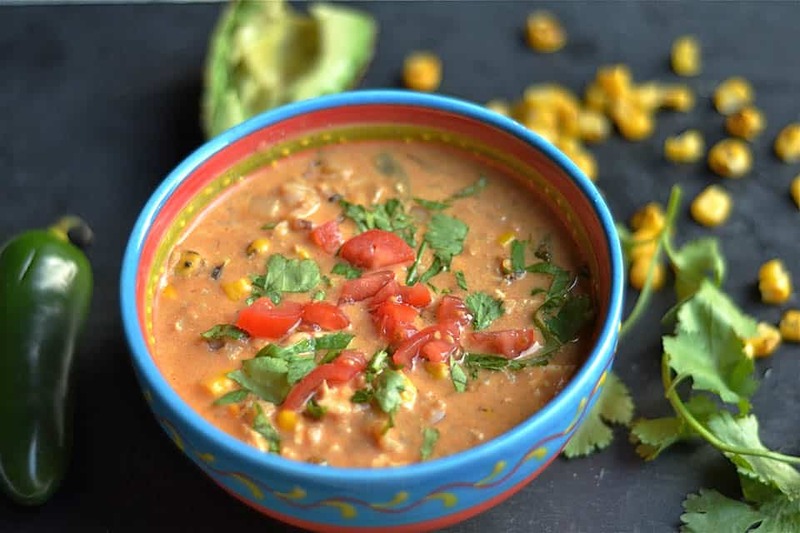 This soup is fun for them because they love to add in their “stuff” and it makes them feel like it’s taco night (their favorite!). Heat up a large soup pot to medium high heat. Add oil to coat the pan. Toss in onion, corn, and pepper. Reduce heat to medium, and sauté for 5-7 mins. Pour in enchildada sauce, chilies, chicken stock, chicken, and rice. Increase heat to medium high, and let soup simmer and cook for about 10 minutes. Add in sour cream and cream cheese. Reduce heat to a low simmer. Cook for another 10 minutes, or until sour cream and cream cheese blend well into the soup. This recipe calls for pre-cooked rice. To make 2 cups cooked rice, use 1 cup rice to 2 cups water. There are also plenty of easy store bought rice options that are already cooked. My personal favorite it Trader Joe's frozen organic brown rice that is cooked to perfection in 3 minutes using the microwave. Wonderful meal! My husband and I loved it! I doubled the recipe, all except the cream cheese, sour crème, chilies and jalapeno. Topped with the diced tomato, a bit of Colby jack cheese, green onions and avocado. No chips were even needed. It was restaurant worthy! Decided to Insta Pot a full chicken and used that broth. Thanks for all your great, healthy recipes! So happy you and your husband just happened to sit next to us at the Chef’s Kitchen a few years ago. I have been a fan of yours ever since!